Award-winning hairdresser Mark Leeson has launched a campaign to give a fantastic pampering prize at his luxurious salon, Mark Leeson in Chesterfield, to the wonderful nurses and carers who work so hard in the local hospitals and community. The campaign runs from now until Saturday 25th April and invites nominations from those who know of a nurse or carer who has made a difference to their lives, or to someone close to them. Eight lucky nurses will be selected from a draw and invited to go along to a special Nurses Day on Wednesday 20th May 2015, at the award winning Mark Leeson in Chesterfield, when the salon will be open exclusively to them. A day of glorious pampering by the Mark Leeson team of hair and beauty experts will include a fabulous cut and colour, a sensory head massage and a selection of goodies. "We really want to say 'thank you' to the dedicated nurses and carers who work so very hard. This campaign is our way of showing our appreciation and inviting others to show their thanks for all they do in the local community. "Supporting Chesterfield nurses is a cause that is very close to my heart. I was diagnosed with cancer in 2013 and spent many months in and out of hospital. It was a dark and horrible journey, but the one thing that made a difference to my care was the incredible nurses. Their dedication and commitment to their role is outstanding and I think this is a profession that is massively undervalued. "Nominate a Nurse is just a small way of us giving something back to the wonderful nurses in our community" said Mark. 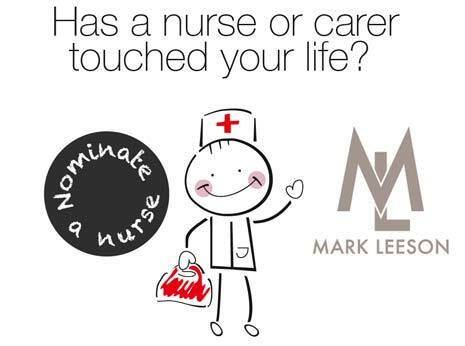 If you would like to nominate a nurse or carer, you can simply email info@markleeson.co.uk, stating the name and workplace of the nominee and your reason for nominating them, together with your contact details and they will be entered into the Nurse Day draw, which takes place at the end of Saturday 25th April 2015. 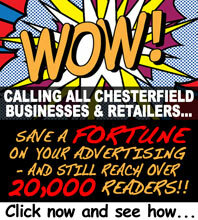 Alternatively, pop into the salon in Chesterfield, where you can fill out a nomination card. For further information, visit www.markleeson.co.uk or call (01246) 238184.